The five months it took to obtain the truth about Jakeway's claims made it difficult for policymakers and taxpayers to assess MEGA's real impact. Jakeway's flawed figures received public attention, while a discussion of the problems with those figures received little or none. Indeed, this delay raises a key concern. If an agency finds that it can release optimistic but dubious claims that cannot be investigated without weeks of FOIA requests and phone calls, the agency will reap false public relations victories that may never be publicly exposed as hollow. In effect, there would be no penalty — and indeed, there would be an incentive — for the agency to make exaggerated claims and then drag its feet in answering information requests from policymakers, reporters and residents attempting to determine the truth. As noted earlier, persistent delays have become a problem at MEGA. Some sense of the difficulty can be gleaned from the author's correspondence with the MEDC concerning the meaning of the phrase "Jobs to be Created" in MEGA's new spreadsheets. Parts of that correspondence are reproduced in "Appendix B: A Sample of Correspondence With the MEDC." 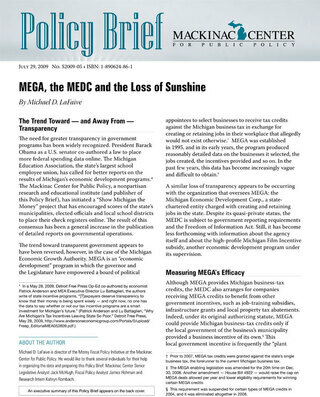 Concerns over transparency in the MEGA program involve more than an insistence on accepted norms of good government. Assessing the program's effectiveness, especially in light of some its less credible claims, has become increasingly important given the state's recent economic decline.